Trying to Find Their Claws: Marcus Mariota to Jacksonville? Over this final week and a half, FishDuck.com Feature Writer Caleb Couturie will be analyzing the 25 teams in the NFL Draft that may look to select Marcus Mariota. Roughly one year ago, with the exact same pick they have now, the Jacksonville Jaguars selected Blake Bortles from the University of Central Florida. Bortles was the first QB taken in the draft, and the one the Jaguars felt would finally change their franchise for the better. They were so certain about Bortles that they spent most of the 2013 and 2014 drafts stocking up on young WRs to try to give him some solid building blocks to work with. The end result? Bortles ranked in the bottom six in almost every major statistical category a QB can be placed in the NFL. Here’s a list of the categories Bortles finished as 28th or worse as out of 33 qualified QBs in: Completion percentage, yards per attempts, interceptions, touchdowns, QBR (of which he was dead last) and finally he took the most sacks out of any other NFL QB. Bortles was absolutely awful last year. Even with a weak offensive line, there’s no excuse for how Bortles performed. Being the third pick carries heavy expectations, expectations that Bortles came no where near of reaching. Should the Jags do the unthinkable, and consider taking another QB with the third pick in this year’s draft? JAC trades: 2015 first-round pick, 2015 second-round pick, 2016 first-round pick and 2016 third-round pick. TB trades: No. 1 overall pick. For TB, this is a win-win. They get some added draft picks, and since the Jags would be trading up to get Mariota, Winston could still fall to them at three. For the Jaguars, they take a shot at another QB who they could either A) trade to Philadelphia for assets or B) keep and use as a motivator to try and bring out the best in Bortles next season. A heated QB battle could be exactly what Bortles needs to try to match the level of success the Jags were expecting, and if he can’t reach that then the Jags made a good decision by drafting Mariota to take his place. Like I said above, the Jags spent a lot of their draft picks in the last tow years drafting skill players. Denard Robinson, Ace Sanders, Storm Johnson, Marquise Lee and Allen Robinson were all added through the last two drafts to a roster that already included Cecil Shorts III, Clay Harbor and Justin Blackmon. 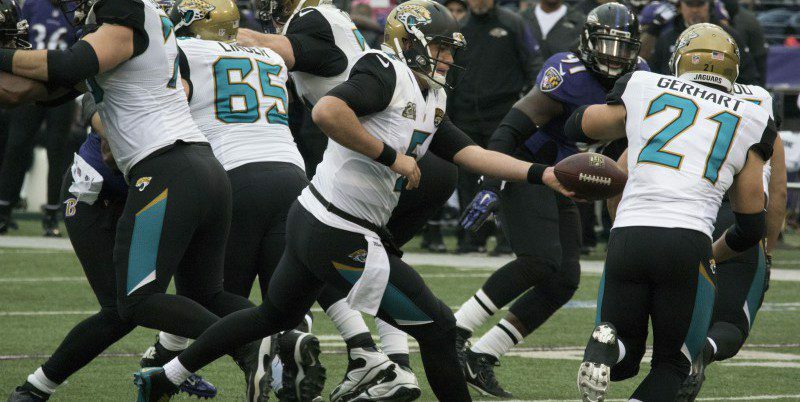 With a healthy and unsuspended Blackmon, the Jags offense actually doesn’t sound all that bad. Mariota, if he were to actually stay in JAC after being drafted there, would have a ton of weapons to work with. Robinson, a converted RB from QB, could even show Mariota what it’s like to change positions if that’s what the Jags were interested in. Essentially, the Jags wouldn’t be taking a QB with the third pick but instead they’d be taking an asset who they could trade, keep and convert or even keep as their starter. It’s a whole lot of mystery, but it could give the Jags options that they aren’t normally used to. If he could outcompete Bortles/if the Jags wanted to keep him, yes.